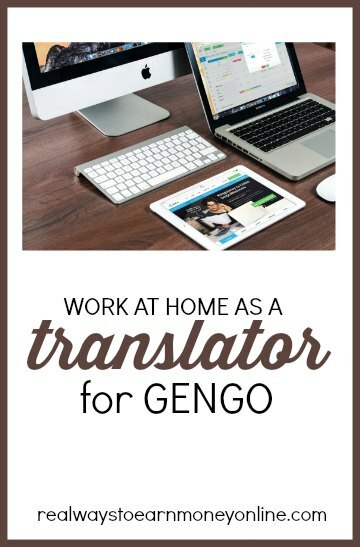 If you are fluent in another language and are interested in work from home translator jobs, you may be interested to learn about Gengo. It's a big site with many small scale translation jobs available. After you sign up and get accepted, you can just browse through the jobs, pick out ones you want to start, begin work, and then get paid! How much does Gengo pay? From what I've read online, this is on the low side, so it might be best to just consider this extra money online until you try it and see how well you actually do with it. It seems like this might be an extra money “side job” to take on. You can get paid twice a month through Paypal, on the 10th and 25th of the month. You do have to request payout before the payment dates to ensure you get your money. They also charge a flat $1.50 fee when you request your payout — according to MyGengo, this is to cover Paypal fees and other transaction costs. These are different levels you can achieve depending on how you do on translation tests you take. There are different projects available for each level and the pay is also different for each level. What languages can you sign up to translate? Languages include Arabic, Chinese, Dutch, French, German, Indonesian, Italian, Japanese, Korean, Polish, Portuguese, Russian, Spanish, and Swedish. Please note that if you do English to Spanish translation, there may or may not be work available due to the plentiful number of people who are English/Spanish bilingual. Related: Check out this list of bilingual jobs from home! What kinds of texts do you translate? A lot of the texts are very short — emails, short articles, blog posts, stuff on Twitter, etc., but there are occasionally longer texts to translate. What if your work is rejected? MyGengo claims to have a very low one percent rejection rate from their clients, so rejections are rare. If you receive a rejection, Gengo's quality control team double checks your work. If they think it wasn't, they will ask the client to either allow you to make some corrections or approve the translation as is. Is Gengo open to people outside the US? Yes, the company considers all people who sign up. They have translators located in every part of the world. If you are not a U.S. citizen, you will have to fill out a W8-BEN tax form. You have to create an account at Gengo and then take their translation tests. Your results will be reviewed and if your translation skills are up to par, you can log in and begin work. If you fail the test, you can retest. They will let you take the test up to three times. What do other people say about translating for Gengo? Here is some feedback I found on Gengo's own support site with info from users on potential earnings. Go here to register at Gengo. Good luck, and I'd love it if you'd comment below, sharing your own experiences with Gengo. The translation page in my directory has about all the ones I’m aware of … I think the most recent one I reviewed was Translators Town, and I think that’s kind of like a freelance bidding site for translators. But it may be worth checking into. I will let you know if I come across one similar to MyGengo. i really did apply for them , and finished their exam , but they will let me know IF i’m accepted or not after 14-30 days ! this is so long time . so please if you know other translating websites tell us about , and BTW thank you so much for your great website . Yes, I’m not sure either. I just assumed it because they asked for the SSN. “Thanks for writing in and we apologize for not getting back to you sooner. of the US who are not US citizens. I took the Spanish-English test a few months ago and didn’t pass it (these tests are very hard to pass) however, I re-took it recently and did pass it. There are some jobs in this language pairs and it is not hard for me to make $20 a day working for a couple of hours. How much you make per hour depends on how fast you are translating. A few months ago when I signed up at MyGengo they asked my for my SSN so I’m pretty sure this job is only for people who are US citizens or have a US working permit. You can work from any part of the world though (I’m a US citizen but I live in Mexico). Thanks Stephanie. The FAQ said their translators work all over the world, so I assumed it was open worldwide. I will send them an email and ask if they can clarify and then update my info if need be.